Martens, a member of the GHM Group, has introduced the first digital safety temperature limiter for thermal industries. The Safety-TL4896 is the first to offer a switch panel installation. Jan Grobler, Managing Director of GHM Messtechnik in South Africa commented “The Safety-TL4896 is innovation at its best, offering users a host of cost and resource savings. A key innovation is that it is the first digital safety temperature limiter available worldwide. The limiter complies with all European Standard safety regulations. It has a reaction time of 0.5 seconds, shutting down the system if it detects an unsafe condition and will ensure continuous operating with the added feature of a pre-alarm for temperature fluctuation . The front LED alarm and the background light of the display illuminate showing the cause as plain text on the display. 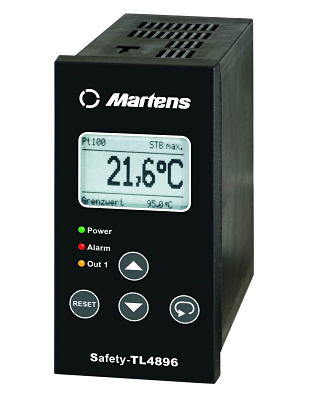 The Safety-TL 4896 eliminates the need for any other measuring instrumentation in the systems chain”. The Safety-TL4896 satisfies all DIN EN14597 requirements and has been issued with a SIL2 certificate. The Safety-TL operates as a direct indicator, because it is installed in the control panel instead of on the top-hat rail. Therefore, the additional “indicator” element can be omitted. With the integrated analogue output for the temperature signal, an additional measuring chain for the measuring signal for the PLC or SCADA world can also be omitted. Another advantage is the execution of the reset function directly on the device. No additional control element is needed. Configuration of the Safety-TL takes place directly via the front-side buttons in combination with the graphic display – without any additional programming software. The advantage of the pre-alarm, which triggers an (preliminary) alarm before the limit value is reached, is that a potential shut-down of the system can be avoided. This makes it is possible to intervene and take corrective action an early stage. Grobler concluded “The Safety-TL4896 is a world first for the thermal industries and enhances a plants compliance and obligations to local regulations”. GHM Messtechnik South Africa is part of GHM Messtechnik GmbH, an amalgamation of globally renowned companies comprising: Greisinger Electronic, Honsberg Instruments, Martens Elektronik, Imtron, T & A Telemetry & Automation; Delta Ohm and Valco.